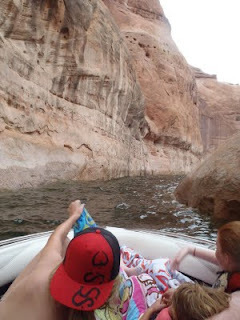 I didn’t want to go to Lake Powell. I wasn’t against spending a week on a houseboat with family and friends on one of the most striking bodies of water in the United States. I wasn’t against spending all day boating and playing in the water, or passing the cool evenings on the upper deck watching amazing sunsets while I ate barbecued chicken. I didn’t mind passing the night hours gazing up at the brilliant stars. I thought I didn’t want to go because of all the hassles of making the trip, but the journey revealed a deeper motivation. Life can be a hassle. Money woes, health problems, family disturbances, and a host of other hassles can make your life miserable. The trail of life is a long slog of ups that elevate your perspective, to downs that blind your view. Although everyone’s road is different, no one’s road is easy all the time. In fact, I would argue that the more difficult roads could be the best roads. Lately my road has taken an unnatural emotional dip. The night before we left I wasn’t feeling well – emotionally or physically. I went to bed stressed and angry, and my anger kept me in lugubrious darkness all night long. I can’t say if I slept or hallucinated. I passed the night in and out of a psychedelic dreams, and none of them were pleasant. I felt like I was drowning in strangeness and swimming in a drunken stupor. I don’t know if I really slept at all. When my wife’s alarm went off at five thirty, I was already wide-awake. I lay there listening to her brush her teeth wondering if I would get out of bed or pull the covers over my head and hide. I didn’t move for twenty minutes. 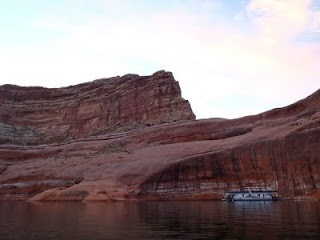 Several hours later we were loading our things onto a houseboat on Lake Powell. We loaded up with food, fuel, and water toys (including two boats and a wave runner) and spent the night in the marina. The next morning we headed out into the channel and went in search of spot to anchor the boat for the next week. 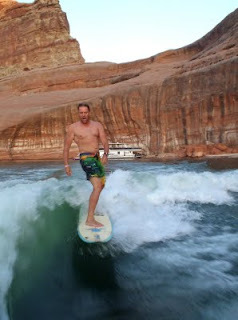 I have flown over Lake Powell hundreds of times. From several miles in the air I have looked down on its blue water extended into the red and brown deserts of southern Utah and northern Arizona like the long fingers of some freakish hand. Sometimes my view was so good that I could see the wake made by moving boats and wondered what it was like out on the water. Now I know. 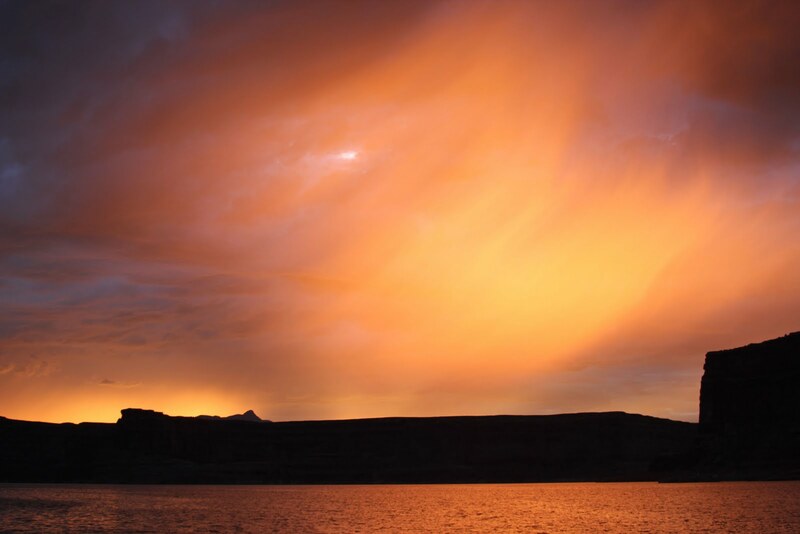 Lake Powell is like an ocean in the desert. It is mammoth in size, but it isn’t the size that impresses, it is the contrast. The water laps up against towering cliffs of red sandstone that look like they been hand carved by God himself in a moment of artistic fervor. Enormous buttes rise up from the water like nature’s cathedrals. 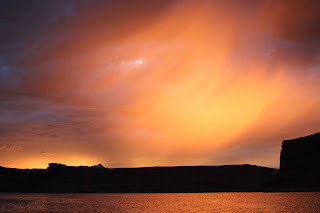 I’m sure that the canyons of carved sandstone were spectacular before the lake was filled, but man has enhanced the beauty God created with the creation of the lake. The blue-green water pops against the various hues of reds and browns. Describing the view as picturesque would be like describing the Mona Lisa as a painting. Even in a houseboat that will sleep twenty people, I felt small compared to the vastness of that ocean in the desert. Contrast can enhance our perspective. Like the steep grades of life’s undulating path, sharp emotions impact us more than the mundane monotony of daily emotional interaction. The contrast in my emotions gave me perspective and insight. I was suffering from a bout of depression. We cruised for a while and let my brother-in-law, Jared, do the driving. He pulled out his map of the lake and we discussed various possible sites to make our camp. We passed several spots – too exposed, too much rock, another houseboat already there. Then we found it. The wind had carved a sweeping curve into the rising sandstone cliff, and deposited a pile of earth at the end of the curve just for us. We buried anchors deep into the sandy soil and tied anchor lines around large boulders to secure the boat against any wind or storms. It was a flurry of activity for about an hour as we put everything in its place, and then we were free to enjoy the lake. We relaxed the afternoon away with a little boating and sightseeing, and after dinner on the upper deck, Jared entertained us with a laser light show against the four hundred foot canyon wall beside the boat. The next morning I woke up at 3:30 and tossed and turned until 4:30. I finally just got out of bed. I snuck to the top of the houseboat and sat down to watch the sunrise. The purple light crept over the top of the buttes and cast a mellow glow over our slice of watery paradise as bats swarmed the air around my head searching for unsuspecting insects. I was surprised at how awake I was at that hour. We spent the morning alternating between wakeboarding, knee boarding, and trying to kill someone on an oversized four-person tube. After lunch we headed for Dangling Rope to get gas and ice cream, and followed it up with a trip to Cathedral Canyon. 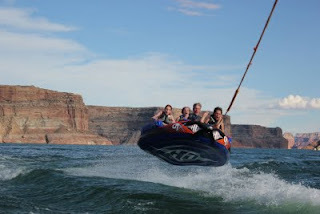 Cathedral Canyon is a must do for any avid boater. It is a channel of water that winds through a slot canyon getting narrower and narrower until you are almost scraping your boat against steep sandstone walls rising up so high that they filter the sunlight and cast a glow on the water like the stain glass window of some medieval church. The wakes of passing boats reverberate off the canyon walls making the pilgrimage treacherous, but you are blessed with deep pools of clear water ideal for cliff jumping at the end of your sojourn. The scene lifted my spirits, but then again, churches should do that. I hadn’t chosen to be depressed. I simply felt it. Here I was spending time with people that loved me in a spectacular setting doing things that I enjoyed, and yet inside, my emotions were churning like the prop wash behind my boat. That afternoon we surfed. With the help of two avid surfers, Jared and Chad, we dialed in a monster wave behind the boat and carved it up. Unlike wakeboarding or skiing, wake surfing is easy on your body when you wipe out, but the ratio between fun and effort is much better. Balancing the board against the face of the wave and letting the power of the passing water push you forward is exhilarating and therapeutic. Unlike surfing in the ocean, the wave is endless, waiting for you to slip from its sweet spot and fall, or run out of gas with your boat. 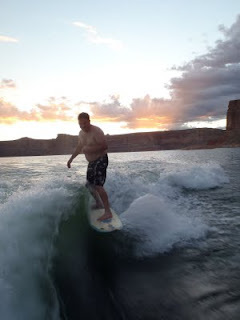 Riding the waves in the mellow light of sunset against red cliffs was iconic. We passed the remaining days in similar fashion, and in spite of the serene atmosphere and uplifting company, the waters of my mind remained turbulent. I returned home as lugubrious as when I left. From now on when I fly over Lake Powell and see the blue water contrasted against the desert colors, I will have a new perspective. I will remember the flying buttresses of its cathedrals. I will remember the brilliant sunsets and star-filled nights. I will remember the clear green water against the brilliant colors of the painted desert walls. I will remember the excitement and laughter of my company. I will remember that in the end, some journeys are worth the hassle. But perhaps, I will remember it most for clear the perspective it gave me of my mental condition and the unnatural emotions we all feel sometimes when we get depressed. I hope this blog post has helped you understand that sometimes depression is not situational. Things around us can be spectacular and beautiful, but we can still suffer inside emotionally. Recognize it for what it is – an unnatural emotion. When you feel that way, take a step back, find a friend, and try to get a new perspective. In the end if you are still suffering inside for no apparent reason, seek professional help.